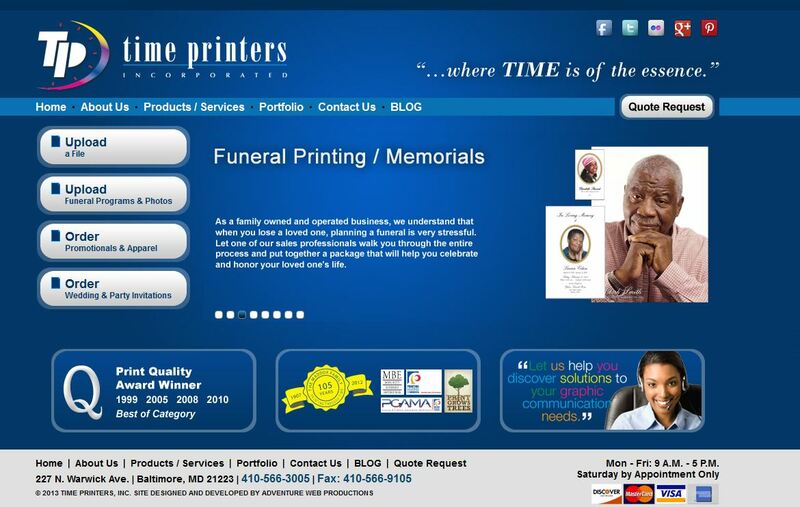 Adventure Web Productions Launches New Site: Time Printers, Inc.
Printing is the Maddox’s family specialty. Generations ago, Booker T. Washington taught Al Maddox’s grandfather the trade in the first printing shop in Tuskegee, Alabama. His grandfather then took his knowledge to Baltimore and opened a small print shop in 1907. Al Maddox learned the skills needed to open Time Printers in 1954 and the company took off. Take a look at Time Printers’ newly launched website for additional products and services: http://www.timeprinters.com.